Test Drive the 2018 Ford F-150 at Van Isle Ford Sales today! The Ford F-Series is the best-selling pickup in Canada for the 52nd consecutive year, and the newly redesigned 2018 F-150 is tougher, smarter and more capable than ever. And within the F-150 range there’s a variety of specifications to choose from: Regular, SuperCab, and SuperCrew Cabs, three different bed lengths, RWD and AWD, and six different engines including a new Diesel, as well as seven trim levels ranging from the entry-level XL, to the XLT, Lariat, King Ranch, Platinum and feature-laden Limited, along with the highly off-road capable Raptor. That’s a lot to choose from, and the best way to evaluate which best meets your needs is to test drive those models closest to your desired specifications. Ford trucks offer a great deal of flexibility in their engine offerings, with a choice of up several powerplants in most models. Engine updates include an all-new 3.3-liter V6 with port and direct-injection technology and flex-fuel capability matched to an electronically-controlled six-speed automatic transmission with three selectable drive modes – normal, tow-haul and sport. The second-generation 2.7-litre EcoBoost now has advanced dual port and direct-injection technology, while the enhanced 5.0-liter V8 brings significant upgrades including advanced dual port and direct-injection technology. The all-new Power Stroke Diesel features a best-in-class 250 horsepower and 440 lb.-ft. of torque. An electronic 10-speed automatic - standard with 2.7-litre EcoBoost, 3.5-litre EcoBoost, 3.0-litre PowerStroke Diesel, and 5.0-litre V8 engines - features five selectable drive modes: normal, tow-haul, snow-wet, eco-select and sport. It’s widely known that the Ford F-150 delivers best-in-class payload and tow ratings of 3,270 and 13,200 lbs. when properly equipped. But there’s more than just pure muscle. The F-150 can be equipped with innovative towing-friendly features like Pro Trailer Backup Assist, Dynamic hitch assist, Smart Trailer Tow Connector, factory-installed trailer brake controller, integrated tailgate step and remote tailgate release, as well as deployable box side steps, as well as standard trailer sway control, part of AdvanceTrac with Roll Stability Control, so make certain if towing a trailer is in your plans that you drive an F-150 with some of these advanced features. 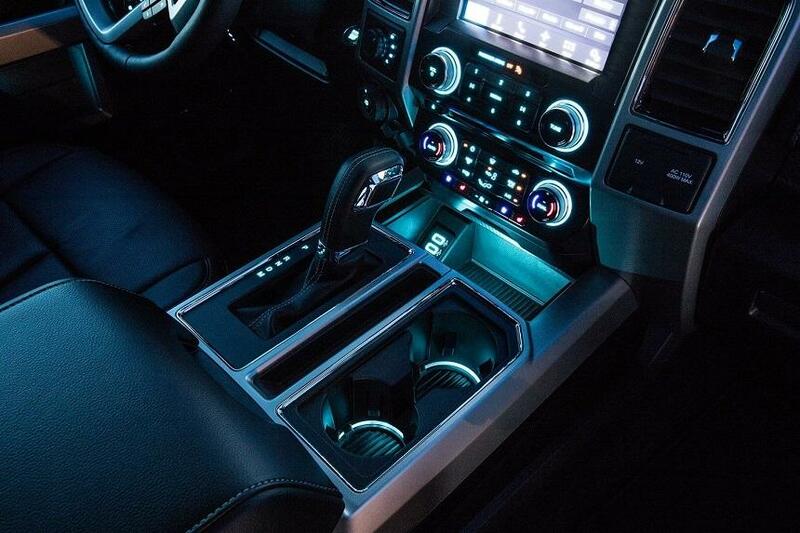 When you climb inside the cab of the F-150 you’ll immediately recognize the Interior upgrades on XLT Sport, XLT Special Edition, Lariat, King Ranch, Platinum and Limited which include color and material changes for seats, instrument panel and console trim. In addition, the F-150 provides plenty of places to store the assortment of things you want to carry inside the cab. Standard door-trim panel bins are supplemented by an under-seat rear storage area, and there’s even space for a laptop and hanging folders inside the available centre console. F-150 SuperCab and SuperCrew feature a class-exclusive fully flat rear load floor for easier access, and more useable storage, regardless of whether the rear seats are up or down. While inside the cab, definitely try out the all-new B&O PLAY Premium Audio System now available on select models with your favorite music. SYNC Connect is optional on XLT and Lariat, and standard on King Ranch, Platinum and Limited. In addition to the voice-activated benefits of SYNC 6, SYNC 390 adds convenience to your driving experience with its 8-inch LCD capacitive touchscreen and easy-to-use interface. Discover the system’s quick reactions to your conversational commands and experience the smartphone-like touchscreen with impressive responsiveness. One thing you won’t experience on your test drive are many of the standard safety and security features dual-stage driver and right front-passenger airbags, and additional set of side-curtain airbags that are part of the Safety Canopy System with side-curtain airbags and rollover sensor. In addition, Ford offers available 360-Degree Camera with Split-View Display, available BLIS with Cross-Traffic Alert and Trailer Coverage, Adaptive Cruise Control with Stop-and-Go, available Pre-Collision Assist with Pedestrian Detection, and Lane-Keeping System. There’s much, much more to the 2018 Ford F-150 than we can possibly cover here. The best solution is for you to drive to Van Isle Ford Sales, talk to our truck experts, and then take a few F-150 models for a test drive. 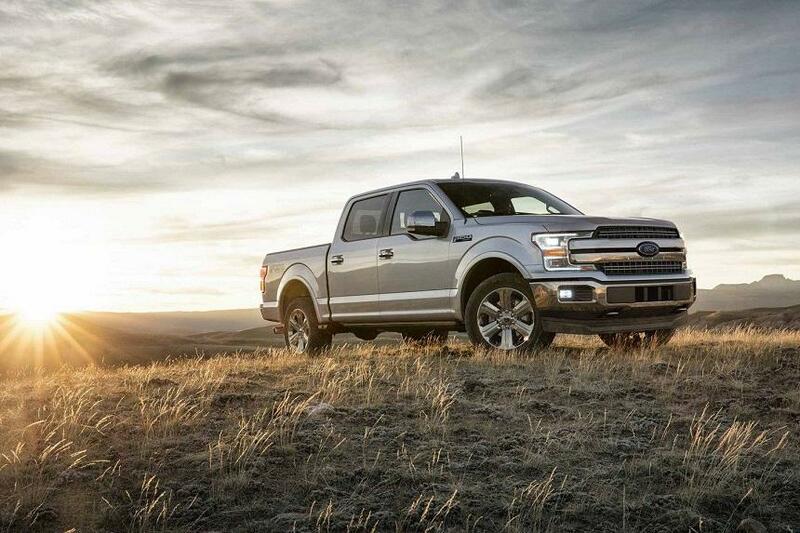 With all the available choices, we know there’s an F-150 that will fit you like a glove.